The figure used for this unit is a Modified Horrorclix figure from the Freddy vs. Jason Action Pack set. Its model number and name are #004 / Freddy vs. Jason. Remove Freddy from base for modified figure. 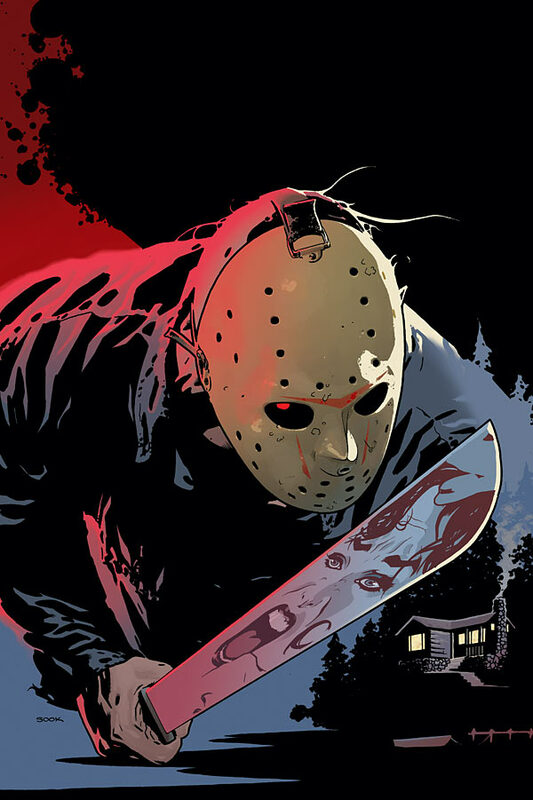 Character Bio - Jason Voorhees, the son of Pamela Voorhees, was born deformed. He lived with his mother at Camp Crystal Lake (his mother was the camp cook), in the city of Crystal Lake. Jason was bullied incessantly until, in 1957, he tried to prove to the bullies that he could swim and drowned in Crystal Lake. One year later two of the Camp Crystal Lake counselors were murdered and the camp was shut down. Future attempts to reopen the camp were plagued with problems, including poisoned water and unexplained fires. In 1980 eight new counselors planned to reopen the camp, but ultimately all but one of the new counselors were murdered. The killer is ultimately revealed to be Pamela Voorhees. Pamela is then beheaded by the only survivor, Alice. The very next year Alice is murdered by an unseen killer in her home. Five years after Alice's murder a group of counselors return to Camp Crystal Lake for training, and all but 2 are murdered (though one of the survivors cannot be found). The killer turns out to be Jason Voorhees. Full grown and seemingly indestructible, Jason kills to avenge his mother's death and to carry on her quest to keep the camp closed. In each new incarnation Jason returns to be an unstoppable killer, only to be "killed" then later resurrected. Q: Friday the 13th says to place Jason "on any empty space on the battlefield where he will not be in clear sight of any opponent's figure". If there is no such space, then Jason can't be placed back on the battlefield, correct? A: Correct. If he can't be placed outside of clear sight, then he can't be placed anywhere. As an Undead, Jason Voorhees has these Undead Synergies. As an Undead, Jason cannot be affected by aspects of certain special powers. Current Special Powers that Interact Differently with Undead. As an Undead, Jason interacts differently with certain special powers. Current Special Powers that Interact Differently with Undead. As an Undead, Jason can be affected by aspects of certain special powers. Current Special Powers that Interact Differently with Undead. Allowing Jason to stay out of clear sight is important, and very helpful for "Ki Ki Ki, Ma Ma Ma" and essential for Friday the 13th. Obsidian's Enveloped in Shadows is currently the only special that allows Jason to be completely out of clear sight, when adjacent to Obsidian. So naturally, they make a good combo. Relentless Assault requires an enemy figure to end their turn adjacent to Jason in order to activate. Potential good combinations for Jason would be figures that deny the opponent from moving such as Blob, Doctor Octopus, Clayface, or Jean Grey etc. ; or ending their turn such as Diablo, Mr. Mxyzptlk, and Star Sapphire(Uncommon) etc. Jason always takes 1 fewer wound. This gives him a lot of immunity to smaller auto-wounding specials, as well as leaving engagement attacks and minor falling damage. An example would be Magneto's Magnetic Assault. It is also best to use Jason to engage lower attacking figures, who will struggle more to destroy him. Last edited by Ronin; November 5th, 2017 at 02:14 PM. "KI KI KI, MA MA MA"
if Jason is not in clear sight of any figure on that card, you may place Jason on any empty space within 5 spaces of his current placement. Jason will take any leaving engagement attacks when moving with this special power. If Jason would receive one or more wounds, ignore one of those wounds. If an opponent's figure ends its turn adjacent to Jason, you may roll the 20-sided die, subtracting 6 from the roll if the figure has Super Strength. If you roll 9 or higher, that figure receives 1 wound. At the end of the round, if Jason is destroyed, roll the 20-sided die. 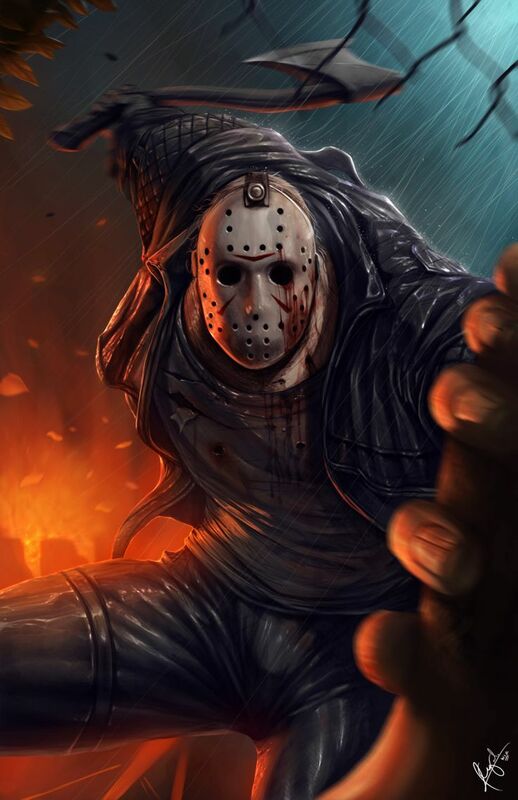 If you roll 13 or higher, immediately place Jason on any empty space on the battlefield where he will not be in clear sight of any opponent's figure and remove all Wound Markers from this card. Last edited by Arkham; February 21st, 2016 at 12:08 PM. Last edited by Arkham; January 11th, 2016 at 10:45 PM. Still a fan of combining Bloodshed and Undead Resilience into one power here. I'm not against it if you can make it work, and sound fluid. I'm fine with it as-is since all 4 powers are short and simple. When Jason is attacked by an opponent's adjacent figure, and no skulls are rolled, the attacking figure immediately receives one wound. If Jason receives two or more wounds from a single attack but is not destroyed, you may immediately remove up to two of those wounds. Not sure I love that, but I guess that'd be my first stab at it. Maybe call it HACK AND STAB. Because the first part is about Jason Hacking on figures who wiff on defense, and the second part is about small injuries not affecting him, like getting stabbed and blowing it off. Plus it sounds cool. Also I love that third picture! The perspective of Jason killing the card holder is amazing! Looks good. I have a slight preference for keeping Undead Resilience and Bloodshed separate, but it's not a big deal either way. I do worry a little about how powerful he is considering he'll be coming back so often, but that's something we can work out in playtesting. I'm thinking as-is, he'll be a pain, but not broken. If he's doing too well, we can either raise his points or lower his life. Considering three(and a half) of his powers only activate if you choose to attack Jason, I do not see an issue. Much like Judge Death, if you choose to attack and destroy Jason, that is on you. If he had an enhanced LEA power I may be a little more concerned but how scary is a single 4 dice adjacent attack? That third piece of art is amazing. Any preference on miniatures? HERE are the Freddy vs. Jason Horrorclix; our options are the one in the back, the one with Freddy, or the one on the right. I'd discount the back one (as he's carrying Freddy's head), and go with either the duo (#004, using it for both Freddy and Jason) or the machete (#003). Overall I'm good with this one. I'd also prefer the powers kept separate, but I'd like a new name for Bloodshed. Can't think of one right now; I'll brainstorm a bit.